Photo 01: A later view of a flight of Bf 109E-7s with auxiliary tanks. These aircraft still have their factory codes and are being ferried to JG52 which, at the time of this photograph, was stationed in Rumania. Photo's 01-02: This series of photographs show the 'Black Men' of 2./JG52 - so called because of their black clothing - with their charges at Calais during mid to late August. Typical of this period, are the yellow cowlings and spinners. Photo 01: A reminder of the high rate of attrition experienced by the Jagdwaffe during the Battle of Britain. By the middle of September, all six of these 2./JG52 pilots, seen here enjoying a refreshing plate of grapes after a mission over England, had been lost. From the left are: Uffz. Lothar Hartlieb, Ogfr. 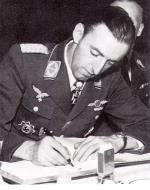 Wladislaw Malecki, Lt. Hans Berthel, Uffz. Peter Weber, Fw Alfons Bacher and Uffz. Karl-Heinz Bokel. 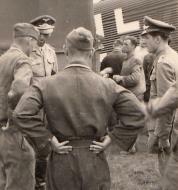 On 26 August, four of these pilots did not return, Hartlieb crashing into the Channel, his body being washed ashore on 15 September, and Malecki, Bacher and Bokel becoming POWs. On 31 August, Weber was badly wounded and died a few days later. 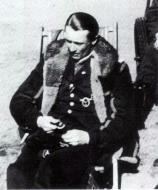 Berthel, then the Gruppen Adjutant of l./JG52, became a POW on 15 September.